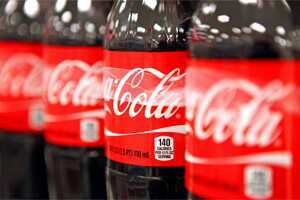 New York: Coca-Cola Co reported a quarterly profit on Tuesday that slightly beat Wall Street estimates, as sales increased worldwide. The world’s largest soft-drink maker, whose brands range from Sprite to Minute Maid and Powerade, said net income was $2.22 billion, or 95 cents per share in the third quarter, up from $2.06 billion, or 88 cents per share, a year earlier. Revenue jumped 45 percent to $12.25 billion, boosted by last year’s acquisition of its North American bottling operations, price increases and a 5 percentage-point currency benefit. Analysts expected revenue of $12.01 billion. Worldwide volume rose 5%. Volume in North America also rose 5%, helped by the addition of new cross-licensed brands such as Dr Pepper. Excluding those brands, North American volume rose 1 percent. Volume increased 7% in Latin America, 2% in Europe, 7% in the Eurasia and Africa segment and 6% in the Pacific region. Coca-Cola shares fell 20 cents to $66.80 in premarket trading.